I admit it's not the mighty stream it was when I was younger. Here's the second mp3 of a track from my all-video set at Bootie back on 1/24. You've already seen the video, now enjoy the audio without the video. Vampire Weekend vs. T.I. 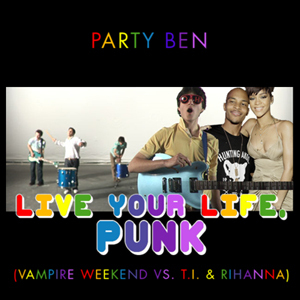 & Rihanna - "Live Your Life Punk"
Mostly this little number is thanks to Kristi, who wasn't that into Vampire Weekend until I told her to get the album, in my defense, but then when I was planning the set and fretting about not having any hipster tunes she said hey, what about that Vampire Weekend band, and I was like, ah, yes, okay. I keep thinking I should do like a 7-minute jump-up jungle version of this, but I guess I'll add that to the to-do list. Okay, so enjoy that. Mailbag excitement coming this week as well, plus, it looks like June-July European Tour is on. 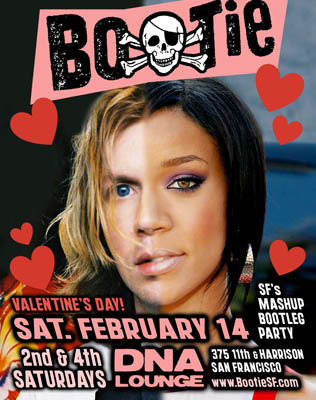 Have an awesome club night that could benefit from Party Ben's ridonkulous DJ antics? Get in touch with my agent.